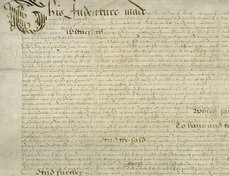 Date: Imprinted at London : [by R. Bradocke] for William Leake, dwelling in Paules Churchyard, at the signe of the Greyhound, 1599. 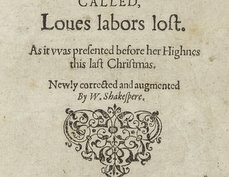 Imprinted at London : [by R. Bradocke] for William Leake, dwelling in Paules Churchyard, at the signe of the Greyhound, 1599. This 1599 printing is the only surviving copy of the sixth edition of Venus and Adonis, first published in 1593. 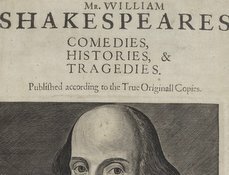 An early owner bound it with other poetic works, including a 1600 edition of Shakespeare's Lucrece and a fragment of the only surviving copy of the first edition of Passionate Pilgrim (1599). 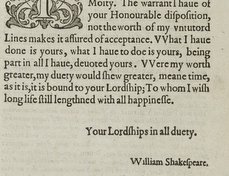 To learn more about the plot and early printing history of Venus and Adonis, please visit the Folger Shakespeare Library's Shakespeare's Works; to read a modernized edition of the poem, see Folger Digital Texts.